Join Olympus Dive Center on our Annual trip to Little Cayman! My name is Dottie Benjamin and I am the Charter & Sales Manager for Olympus Dive Center. We are excited about returning for another fabulous week of diving in Little Cayman this December! Little Cayman is truly "the island that time forgot". You can look forward to spectacular wall dives and clear warm blue waters that can be found in the Cayman Islands. 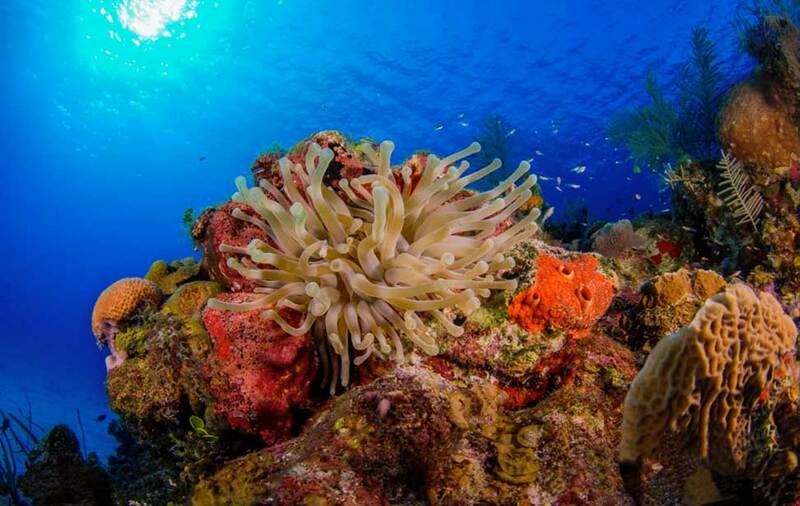 To tell you a little about Little Cayman… it is rated as one of the top five dive destinations in the Caribbean. Gorgeous wall dives start at 18 feet (that’s right – the wall starts at 3 fathoms!) and descends to over 6000 feet. Healthy reefs and diverse fish populations make it a great environment for fish watching, photography and videography. Expect to see lots of turtles, nassua grouper, snappers, grunts, jawfish and the list goes on and on! I would love to show you all the cool little critters that make their home in the reefs around Little Cayman. I have over 5000 logged dives in Little Cayman and I know all the hot spots! We will be staying at the Southern Cross Club and they are ranked the #1 hotel on Little Eagle RayCayman by Trip Advisor and Green Globe Certified. There is a lot of natural beauty to take in around Little Cayman from the iguanas that have the right of way to the Red-footed Booby birds. Join me for a fun filled dive week in my home away from home – Little Cayman. Little Cayman has the Bloody Bay Wall Marine Park, famed for its vibrant colors and dramatic drop offs and swim throughs. Bloody Bay Wall East and West - This part of the wall starts at about 8 metres/25 feet and drops into the deep blue. Look for large orange elephant ear sponges, black corals and wire corals along the sheer drop-off. You might see the occasional seahorse. Three Fathom Wall or Mixing Bowl - Starting at 6 metres/20 feet, then plunging vertically far deeper than you can go, this wall dive is a thrilling adventure as you glide over blue water. This is where Jackson’s Bight, with rugged coral fingers, meets the Bloody Bay Wall. Admire the purple, red, yellow and orange sponges and schools of fish in the shallows. Marilyn's Cut - Beautiful wall dive with alcoves to explore. A large spacious cut into the wall drops you out on the main wall at approx. 80 feet... turning left or right - the beauty is something to behold. Keep your eyes for an eagle ray or shark cruising by. Dot's Hot Spot - One of the newer dive sites in the Bloody Bay Marine park named after someone you might know... hint hint. The dive sites offers a variety of habitat from rugged wall to bustling hardpan with plenty to see. Also, it is hamlet heaven - shy, indigo, masked, butter and more have been spotted there.